You put so much effort this year and now everything is about to pay you off. You close your PC and iPhone, and start to make plans for your 2-week long vacation. But, you know, there will always be people (your subscribers) trying to send you email while you are soaking up the sun in a remote beach, hoping that you will actually respond to their emails no matter where you are. In this case, you will have to make sure that your contacts (subscribers) know that they will have to wait until you get back from your vacation. 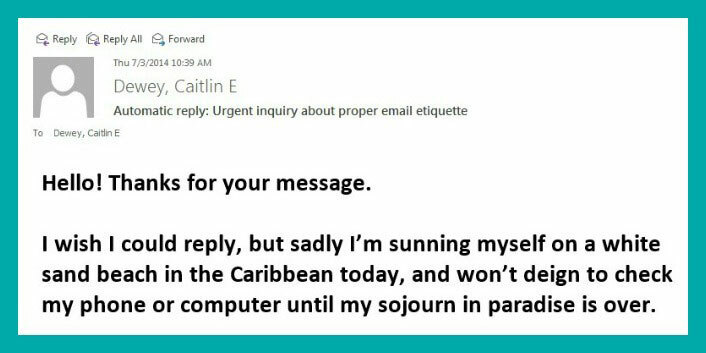 A humorous email, like the ones shared in the list below, is a message you sent to your contact when you are just about to leave your office for vacation. Whenever one of your contacts tries to contact you through your e-mail in your absence, this is the message you will send them. Most of the time, it is set as autoresponder email messages, which automatically is sent when someone contacts you via an email in your absence. This message lets your audience know how long you will be away from your work desk when you will return, and/or the next best available person to contact. These autoresponders are used when you are going on a vacation for a long time. I have run away to join a different cause. On a beach, no laptop, no iPhone. Back [date]. I am away until [date]. 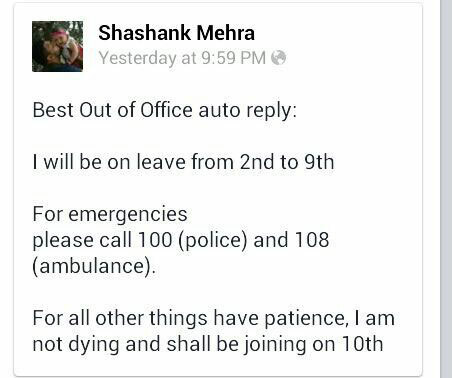 Please contact [name] during my absence. He will not help you either. I am away from the office right now. Unfortunately, I will be back tomorrow. I have run away to join the circus. A different one! I am out of the office until [date]. Enjoy the quiet. I am not really out of the office. I am just ignoring you. I’m sorry. I can’t reply now. I am not away but I’m just hiding from someone, pretending I’m away. If it’s not you I’m running away from, I’ll reply your email. I’m going to be out of Kansas from June 11th to June 17th. If you require urgent assistance, just I double click on your ruby red mouse and tell yourself there’s no place like home. Dorothy. I am on a paid leave right now for two weeks. When I get back, I will be on paid return. Upon completing my one week of paid return, I will address any issue or questions you have at a pace I am comfortable with. This is the most likely pace that you will not be comfortable with. I will be out of the office and return next week. I have incredibly easy access to a phone and email, but I assure you, it will not be used for work purposes. I am on vacation from [date] to [date]. I will allow each sender one email. If you send me multiple emails, I will randomly delete your emails until it is pared down to one. Choose wisely. Please note that you already sent me one email. 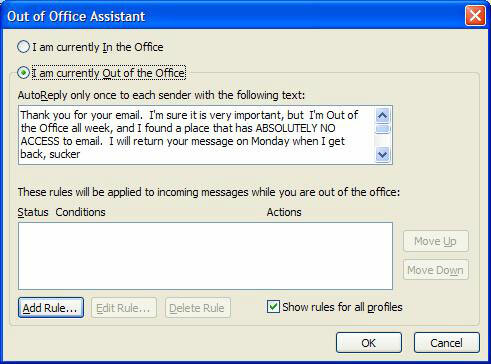 I’m out of the office and returning tomorrow, at which time I will promptly delete all of your emails. Hey there, could you give me a call instead? I’d rather deal with this over the phone. If I don’t answer, just keep trying. I’ve been having issues with my phone. I am currently out of the office. I have a cell phone, but I will not be giving it to you. If you can guess the number, I will take your call. 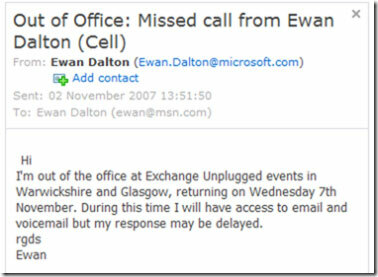 I will be out of the office from [date] to [date] without access to email. If this is an emergency, please call 911. I am out of the office. If you have immediate questions or concerns, please contact my manager [insert name here]. If your questions or concerns are not immediate, you might want to ask yourself why you emailed me. I will be away from work for one week while training. When I return, do not expect any improvement. I will out of the office from [6/11] through [6/17] – returning to my desk 6/21. If you know who shot J.R, contact the Dallas Police Department. If you have a problem, if no one else can help, and if you can find them, call … The A-Team. If you have information that may lead to an arrest in the murder case of Jon Benet Ramsey, contact the Colorado Springs Sheriff’s Department. I received a great opportunity to work on an exciting [project]. I‘ve asked [professor name] to take your classes in the meanwhile. He’s brilliant at his job. I hope you will be as excited to work with him. Thank you. They say the grass isn’t always greener on the other side of the fence. I am currently testing that theory. Wish me luck. I recently quit this job because of the emails from people like you. I hope you are happy. Hi! 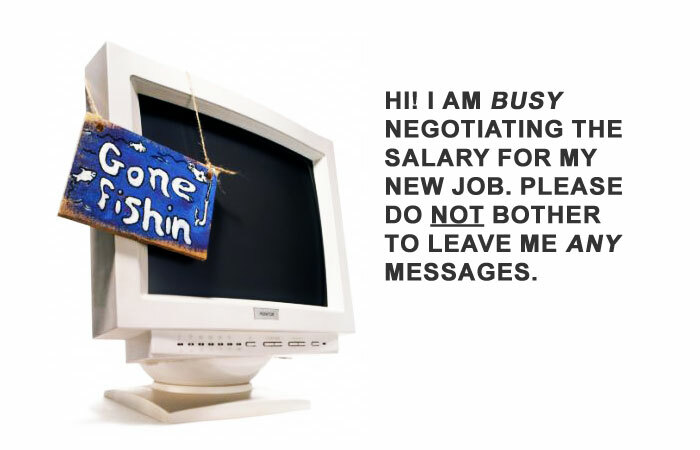 I’m busy negotiating the salary for my new job. Don’t bother to leave me any messages. I am away at lunch. You should consider trying it. P.S – This is not an invitation. 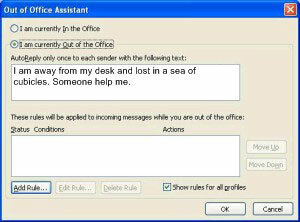 I will be out of the office until… hell freezes over. Please reply to this e-mail so I will know that you go this message. I’m thinking about what you’ve just sent me. Please wait by your PC for my response. 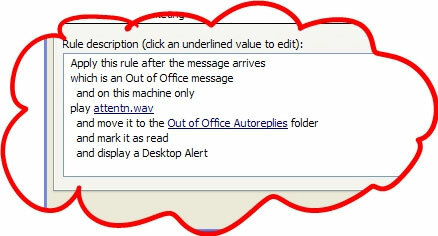 Thank you for your message, which as been added to a queuing system. You are currently in 352nd place and can expect to receive a reply in approximately 19 weeks. On annual leave, hope to win the lottery and never return. You are receiving this automatic notification because I am out of the office. If I was in, chances are that you wouldn’t have received anything at all.